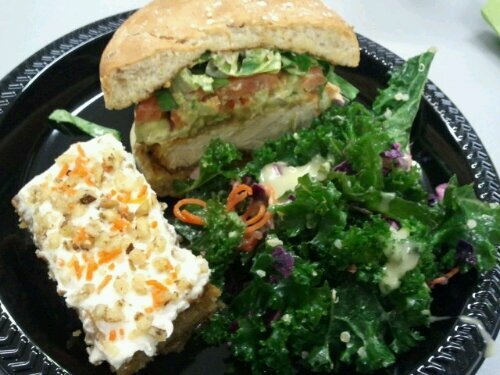 I know I’m way overdue in telling you about the Vida Vegan Con Tech Seminar. 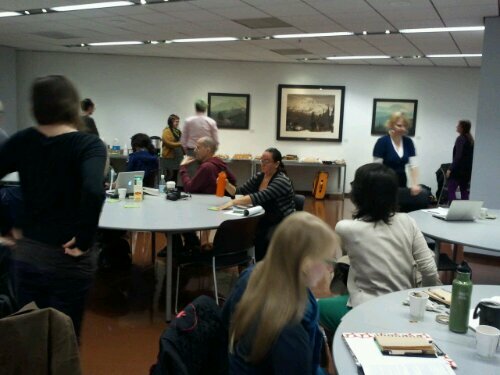 Fortunately, I had already uploaded the pics of the seminar to WordPress after the fact. Otherwise they would have been lost in New Orleans with the rest of the pics that I hadn’t done that with, when my phone crashed to it’s untimely death on Bourbon Street! The seminar was held downtown at the Seattle public library, and it’s a very cool looking building. 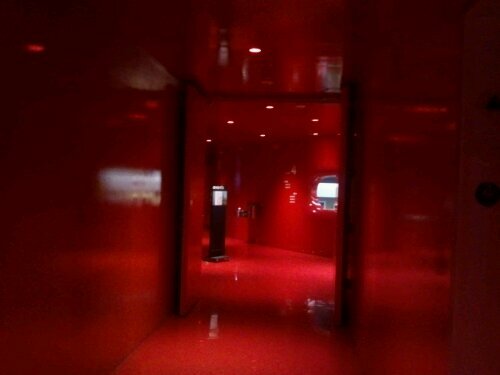 The 4th floor is where all the meeting rooms are, and it looks like how I imagine the inside of womb. This is the view as you step off the elevator. I found my tweeps right away including Molly, Brit, Helen, and Dawn, whom I had never met before in person. We chatted for a little while and then got serious with our notebooks as the first speaker took the mic. We had an interesting variety of topics that day, starting first with HTML, and writing code for websites. I’ll admit, it was a bit over my head. My skills in this department are limited to using templates, and copying and pasting code to customize when I’m feeling fancy. Seminar topics included Nuts n Bolts of Webpage, Blog Design in an Ever-Changing Digital Landscape, Podcasting on a Budget, Shooting, Editing and Integrating Video, and Next Level Social Media. 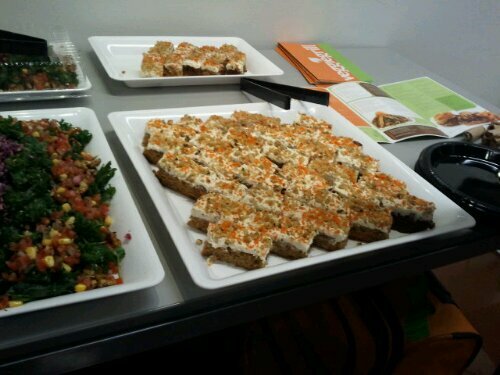 Lunch was provided Veggie Grill, which is now in Seattle! These were the Santa Fe Crispy Chickin’ sandwiches ($8.95) which were absolutely awesome and made up of Fried Chickin’, lettuce, tomato, red onion, avocado, spicy vegan mayo! 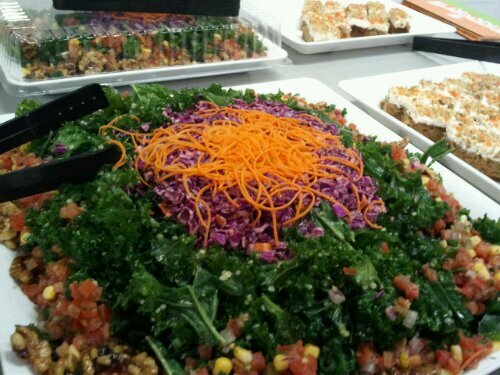 Also provided was their All Hail Kale salad (Yay, kale!) ($8.45 in stores) consisting of Marinated kale and red cabbage, corn salsa, agave-roasted walnuts, and ginger-papaya vinaigrette. SUPER good. Lunch would not have been complete without dessert, and little carrot cakes also came with the spread. I’m not a big sweets person, so I wasn’t crazy about the very sweet carrot cake, but they had also given us Mighty-O Donut holes that morning, so I might had already reached my sweets capacity for that day. My first helping. Followed by another half a sandwich and another helping of kale. Mmmm! 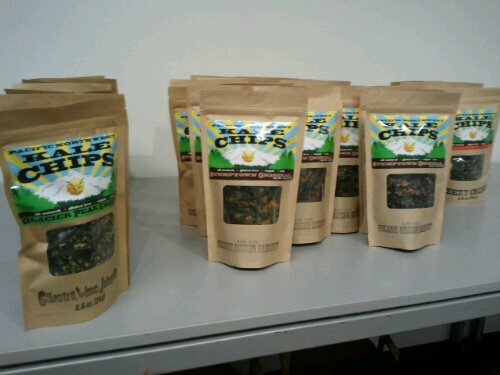 They also had bags and bags of Pacific Northwest Kale Chips, which were incredible. Here are Brit & Molly showing off their bags. They had two flavors. Both had a little spicy kick. 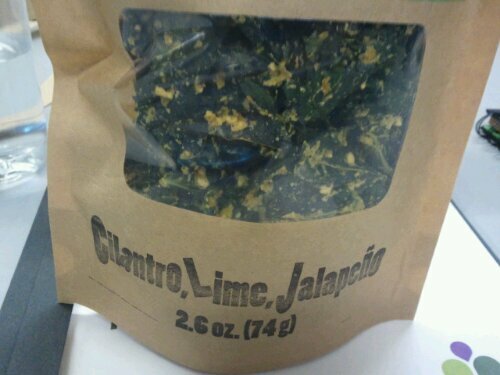 The cilantro, jalapeno were my favorite. 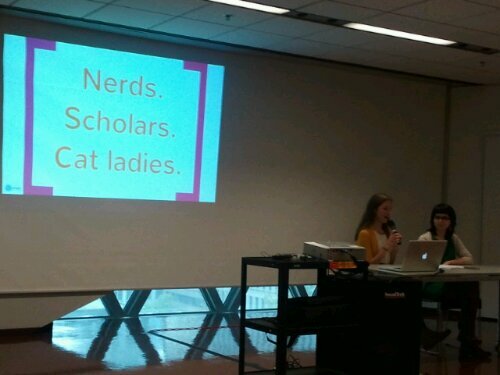 This was one of the slides from the introduction to Helen & Dawn’s presentation. 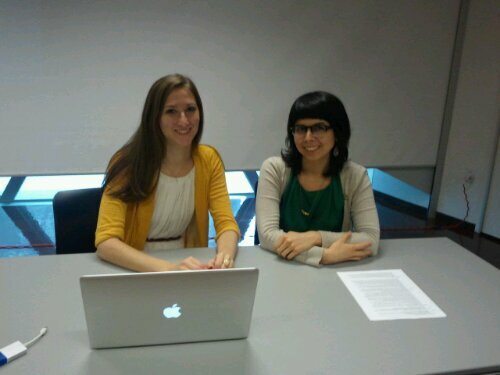 And here’s one more of them prepping for the talk. It was a really nice experience overall. 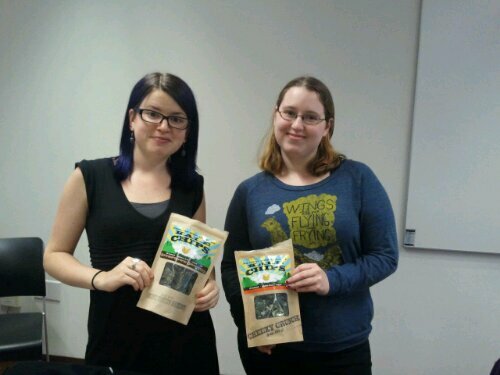 It was great to meet the Vida Vegan Con girls, and we got to take in plenty of good food and inspiring information. I was definitely able to start using some of the tips right away, and am planning to do more in the near future. Posts should be coming back to a normal pace of frequency now that we’ve got the WIFI situation setup at home! 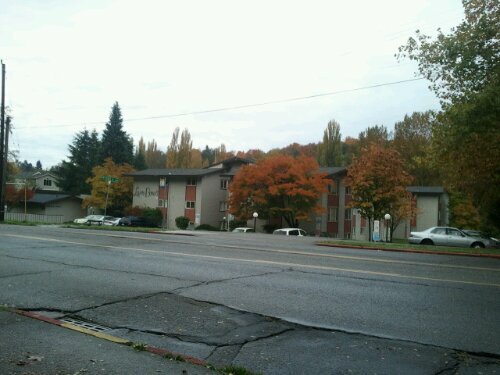 ← Drive to Seattle update – Happy Thanksgiving! It’s going to be great. Thank you for sharing about the Tech Seminar! 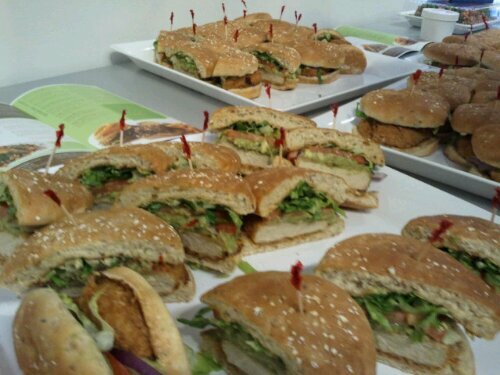 I need some VeggieGrill in my life, stat! I hope the food tasted as great as it looked!